Winter storm Xaver hit Northern Europe claiming three lives in Poland, bringing to six the toll of people killed in hurricane-force winds. Xaver blew a tree on to a car in Poraj, northern Poland, killing three people inside. Most flights have been cancelled at Gdansk airport and there is serious travel disruption in Germany too. Many schools have been closed across the north of Poland and Germany. Parts of Hamburg have been flooded. In Poland at least 100,000 homes are without electricity because of severed power lines. The port of Hamburg, which handles a huge amount of European trade, is at a standstill. Hamburg has experienced its biggest tidal surges since the early 1990s. The city’s fish market and some streets by the river Elbe were flooded. There was also limited flooding in the Netherlands – officials say the sea dykes withstood the onslaught. The Dutch and German authorities cancelled many flights and train services. The Oeresund road-rail bridge, linking Copenhagen in Denmark with Malmo in southern Sweden, has reopened. It had been closed on Thursday evening amid high winds. A woman died in Denmark after a lorry was blown over. In Scotland a truck driver was also killed on Thursday when his vehicle was blown over near Edinburgh. A man was crushed by a falling tree in Nottinghamshire, central England. 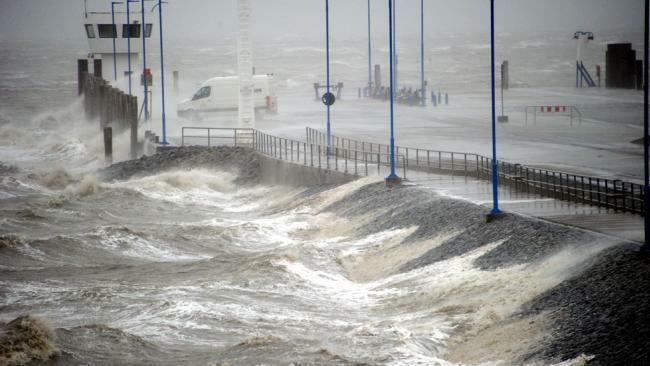 Winds of up to 142 mph battered Scotland. England’s east coast experienced its worst tidal surge in 60 years, while in north Wales residents had to be rescued by lifeboat crews. Two sailors were reportedly swept overboard from a ship 14 miles off the southern Swedish coast, and air-sea rescue services failed to find them. In the low-lying Netherlands, the Eastern Scheldt storm surge barrier was closed off for the first time in six years. Dutch authorities said they had issued the highest possible flood warning for four areas in the north and north-west of the country. There was some flooding in Dordrecht and Rotterdam. But rail services are generally running normally in the Netherlands, the NOS news agency reports. In Schleswig-Holstein, north Germany, many rail services have been halted. Fallen trees are littering railway lines. The Dutch airline KLM cancelled dozens of flights from Amsterdam’s Schiphol airport on Thursday, while more than 120 were cancelled or diverted at Hamburg airport. But Schiphol flights are now back on schedule, NOS reports. Flights from Glasgow, Edinburgh and Aberdeen airports in Scotland were cancelled. Rail travel was badly affected, with all train services in Scotland cancelled because of debris on the lines and damage to equipment. Services in northern England were also hit.